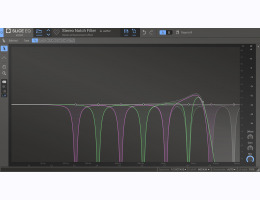 Slice EQ is a truly modern parametric equalizer, it cuts, or enhances, frequencies with surgical precision using razor sharp digital filters up to 96 db/Oct. It is an advanced parametric equalizer, with great modulation potential. Especially when it is used with Snap Heap. Slice EQ won't let anyone down soundwise. Using top of the line, digitally clean filters it will give you a crisp result every time. With a recognizeable workspace layout the Slice EQ user interface makes sure you will quickly find your way to all the features. All Kilohearts plugins get the job done quickly. That way you can stack them high without worrying about performance issues. The Slice EQ workspace is freely resizable and you can set the UI scale to match your preference. This can be very handy at times. Slice EQ works with our excellent Snapin hosts. Check out Snap Heap for instance. 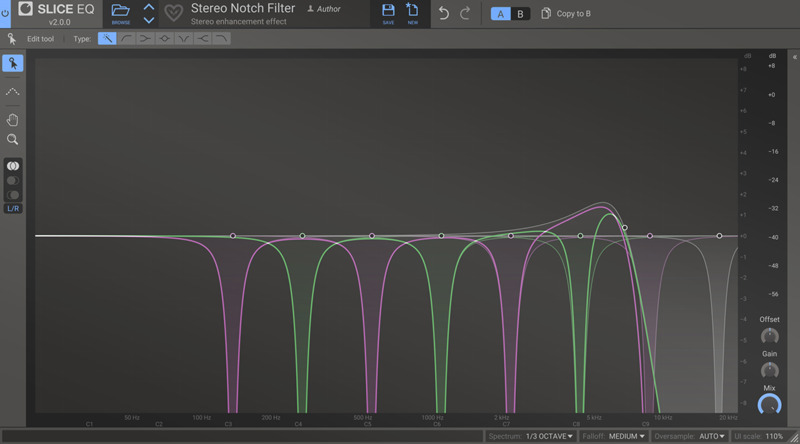 By default Slice EQ will help you out with a context aware filter creation tool. Depending on where on the filter curve you click you can create the most common filter type for that frequency range. If you need a specific filter the Edit Tool can be set to create any of six different filter types that will cover your every need. Using others sounds or songs as a reference has never been easier. Choose from the factory profiles or create your own from any WAV file. You can also use a sidechain channel as a reference. When EQing you can sometimes start having problems determining if you are actually making things better or worse. Use the A / B comparison tool to find your way forward. Are you used to working in Left/Right, or Mid/Side? Either way Slice EQ presents your filters in a way that is intuitively understandable at a glance. Zoom and pan the workspace anyway you like to get the best view of what you are doing. You can also zoom and pan with the mouse wheel and click and drag on the axis labels. Plugivery is an official distributor for all Kilohearts's products.